NEW to Australia, this absorbent floor sweep is the ultimate. It is extremely economical, is wind resistant, ultra absorbent, inert and has the best non-leaching properties available. 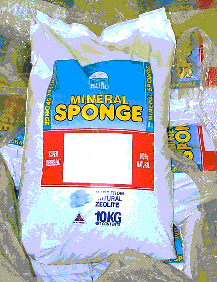 Mineral sponge is suitable for use on paint, ink, petroleum, oil, foodstuffs, animal waste and all liquids excluding hydrofluoric acid. A new indoor floor sweep has been developed for use in hospitality, health, childcare, manufacturing, supermarket/shopping centre and office environments. It offers an ideal means of cleaning up spills involving liquids, semi-liquids and broken glass. 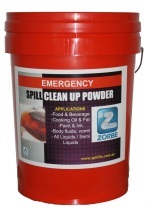 By using this product in the containment and clean-up of day-to-day spills the chances of slips and risk of cuts from broken glass are greatly reduced. Australian made oil-only, general purpose and hazchem needle-punched polypropylene absorbents are very strong and reusable. Each 45cm x 52cm pad absorbs up to 25 times its own weight in oil. 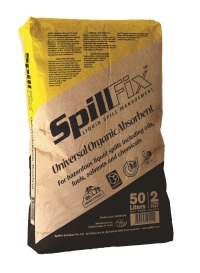 An economical solution to removing oil from water and is ideal to float on water, use on rocky surfaces and are widely used in shoreline clean-up operations. This 'hydrophobic cellulose biodegradable fibre' is almost dust free. It removes hydrocarbons off water at up to 15 times its own weight. It is biodegradable and will not leach when placed into land fill. K-Sorb comes in a 13.36kg compressed bale that absorbs up to 200 litres of oil. K-Sorb is used in a filtration medium in drain protection units as well as pillows and booms. product code: SC01512 - 13.6kg bale. 1.48m x 30m absorbs approximately 227 litres. Designed to provide sorbency and spill protection in rail and aero specific applications. A tier of absorbent meltdown material is top layered with needle punched felt and then poly backed with a chemical resistant material to keep unwanted fluids from getting to the ground. This new product is currently being demonstrated throughout Australia and will be commercially available in March 2004. 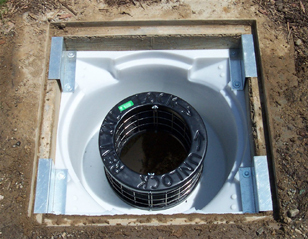 Triton Storm water filtration units are permanent fixtures that prevent silt, debris, sediment, hydrocarbons and metal coolants from entering storm water drains. Please contact us for further order information. Hi Visibility Fluro Orange Backing. 25mm Yellow Reflective Tape. "A" Grade Beige Cowhide Leather Palm. 3M� Thinsulate Lining for Extra Warmth. 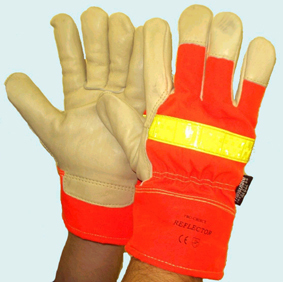 Also available without the 3M� Thinsulate Lining, "GLO" Gloves. The Kaddie Cart ideally suits the storage and transportation of spill clean-up absorbent and containment products right to the source of the spill. No reaching over to strain the back whilst getting the spill material out of the wheelie bin. Just open the front door on the Kaddie and remove the material suitable for the job. The Kaddie is also lockable, thus preventing the incorrect use by those who normally wouldn't have access to the spill kit.